Well if you think there's no hope for Initial D Arcade Stage Zero to come out outside Japan, there is. Because from tomorrow till 30 May (TUE), Hong Kong arcades are having the first ever location test for IDAS0 outside Japan. Hopefully that means other regions in Asia will upgrade to Zero soon, including us Malaysians. We could only hope. 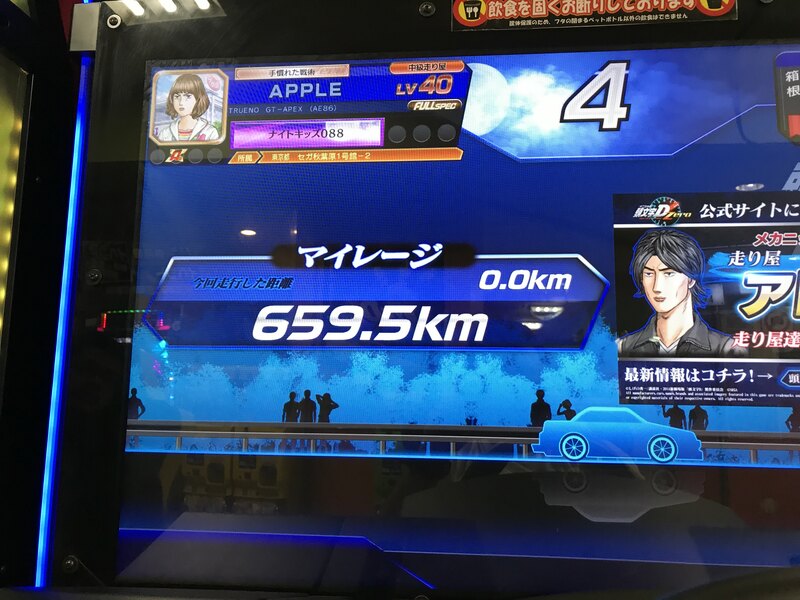 Source from the Hong Kong Official Initial D Arcade Stage Facebook group. 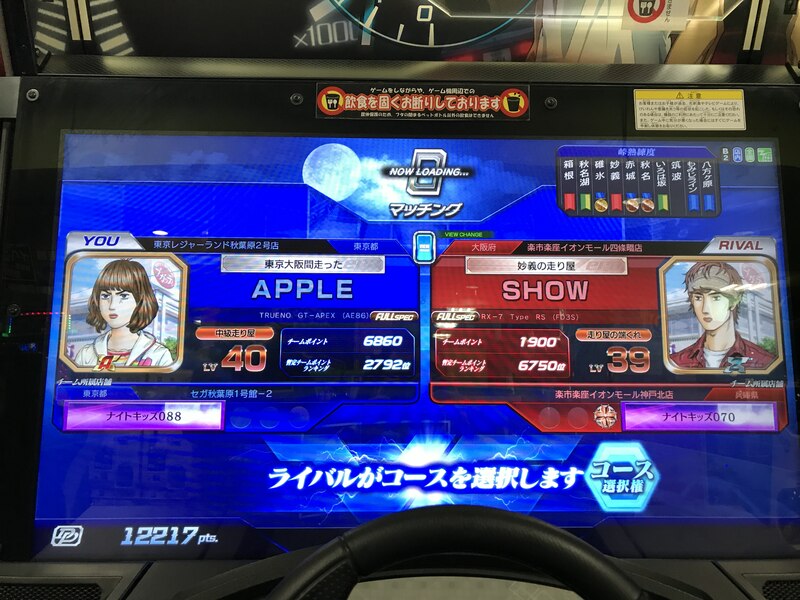 Currently in Japan, and have tried out D0. I'll be honest despite the massively inferior wheel and the poorer course selections, the game itself is pretty fun gameplay wise. I've mostly been playing online battles of the two hours or so I've played it. Currently up to Spec 4 or so, with no D-Coin usage (don't think I could have afforded it anyways). I'm currently using my Malaysian Banana Passport card to play the game. Good that it works though I guess my Japanese profile won't be usable on the upcoming EXP version. Also the screen is HUGE! I've seen the pictures and the size comparisons but it's one of those things that only hits you when it's physically in front of you. The new screen also makes the game looks really crisp even though they're using the exact same assets. The advantage of not playing on a ten year old screen I guess. The new H-Shifter also feels damn good. Totally better than Wangan's, not that it's saying much. I personally think the lower spec gameplay is much funner than the D7/8 equivalents since those games only become more fun nearer to their Full Spec physics. Spec tuning also plays less of a role than before in terms of beating opponents. I've beaten people that are higher spec than me and the opposite have already happened. Tuning works differently than before since your specs is gated by your level. Spec parts are cheap compared to before but you are only allowed to access the menus once you reach a certain level. For example, the game might allow you to buy five parts when you reach Level 5 then the next set only unlocks when you reach Lv 8 or so. Technique wise, I'm basically using BCCCC variants for the moment. I see more people using traditional BC, but when I use in the game I tend to be slower. Might be one of those things that changes once I get to Full Spec. I haven't played any Story Mode or Time Attack except for the fittest game, just basically playing online cos I have a chance to free free games - and free games is good hehe. So far have mostly won the battles but I also had a four loss streak at one point too. Also thanks to SHINN for some gameplay tips on D0. Did close to zero research on gameplay so don't know how the boost conserve system works for this one. I still don't know actually......I just try to get gold drifts at corners. LMAO poor wangan getting the jab. Glad that you're enjoying D0. I have to agree that the screen is a massive improvement. So is the shifter, although I was a little worried it would break due to how long and thin the shaft is. BTW, if you're visiting Tokyo, I heard they're doing some location test at the Club Sega in Akiba for the new Sega driving game: https://swdc.sega.jp/. Might check it out if it's still there. Okay, trip to Japan is almost finished, so posting my final race for this trip. Some more things to say about D0. Image size reduced, original size: 4032 x 3024. Click here to view the image in its original dimension. - D7 and D8 started by getting rid of Wet TA - well D0 got rid of Wet period. Personally I don't mind since Wet in D7 and D8 barely had much different anyways and served to slightly annoy me. Still wish they just made Wet and just made it much more different than Dry. - No more three car limit for the garage. Now you can buy any car from the list without deleting another. Downside is that apparently you can only have one of each car. - You no longer get character parts in online battles. I don't know about Story Mode, but I can only get them by buying them using points. You can however get them through missions and events I think. - Character roulette is gone too. Now it's basically a lootbox, you purchase the box. While not a super big deal, this kinda kills of the element of control. Sure the parts that appear on the roulette as well as the stopping speed was random in the older games but it still felt like you had SOME control. On that note, you can buy them with regular points now (DP), which is good I guess. Same goes for backgrounds though I didn't try and get one. Not having a roulette makes it....:less exciting for some reason. - Meters are now given away by Sega. Not sure how to earn them but to be fair. Same goes for some background and character parts too. I honestly really hate the default D3 meter, it's really hard to see the speed and the gear number and it doesn't have the speed color indicator. - As we know, the drift indicator is now integrated into the lights of the machine as opposed to being part of the default HUD meter. At first I was worried that the flashes were gonna be distracting, at least to me it isn't though I can't say the same for someone with epilepsy for example. However the problem with it isn't that it's distracting, but rather that it's kinda hard to tell. 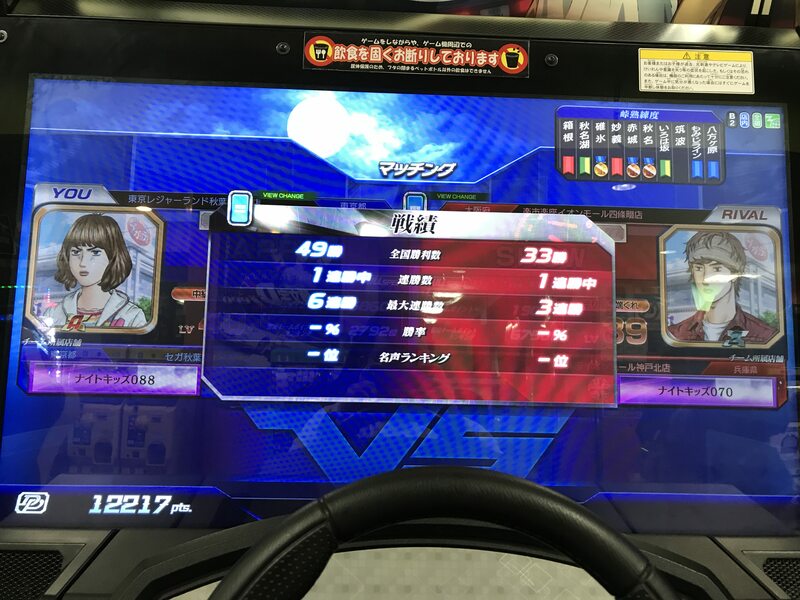 By default the machine will strobe either white or yellow lights depending on whether you are on a "Takumi 86" or a "Keisuke FD" cabinet (and yes it's written there on the signboard). They will then strobe orange when you initiate a drift that will conserve your boost. The thing is, it's actually kind hard to tell when it's doing this, or rather it's hard to use it while racing. The drift indicator is important because it's needed to show that you are drifting correctly and that your boost is being conserved. 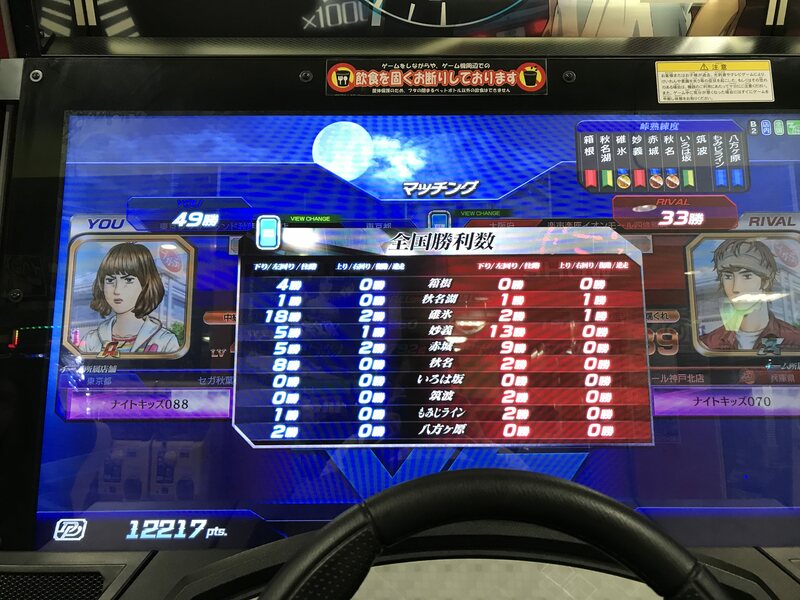 This is a worse problem on the Keisuke FD machine because the difference between the yellow and orange is harder to tell, certainly I found it easy to miss. This is a bit problematic especially if you are learning the game and are finding out what works well when you do something and what does not. Basically, get a new meter ASAP. This made me think why Sega just didn't include a default Drift meter. It's good that the lights don't appear to be distracting but when it becomes an important gameplay mechanism, it should be part of the default HUD or at least design a better LED system. When moving from a way that is better, this is noticeably worse. - Sadly the Prius is gone. It wasn't a good car but I'll still miss it. There was a certain charm in using a Prius and winning with it. And yeah the AE86T2 is still there. - That all being said, gameplay wise D0 is really really good IMO. It's definitely an IDAS game through and through. I would say it's a combination of D8 and D6, with a conserve system in place sort of like D5, but you drift to conserve instead of slowing down. - I'm usually fairly comfortable with Akina DH but for some reason I'm just not feeling it in D0. I'm better at Akagi DH than it, which is weird. Also Momoji and Irozahaka is damn hard to play in this version IMO. - Can't wait for the EXP version to come out. Anyways D0 EXP was released in Hong Kong today. Taiwan coming soon and eventually I'm hoping Malaysia. And more importantly for me JPN card data can be used! Mwahahaha. Yay save money. Could this mean there's a chance that Round 1 can bring D0 to America? United States is listed as one of the countries on that drop down list. This page is for describing all the locations of all the D0 machines. Hong Kong already has a few shops. Now, early on D8, the website also listed US before it was removed. This doesn't mean it would have it, but there is a chance. It would be up to the arcade itself of course. Has anyone noticed there was some new update to D0 called Ver 1.2, which added in Kyoichi, Seiji, Wataru, Kai and Miki and I believe Akina Snow? Here's what I mean new update. Seems this game has some mechanics from ID8. Had little knowledge when i started playing Zero, glad to know this community's got good people i can ask questions to. Found a few youtube vids where they had a course specialist going through time attack and used that as a guideline. And it helped!